This is an add-on for Actor Inventory. 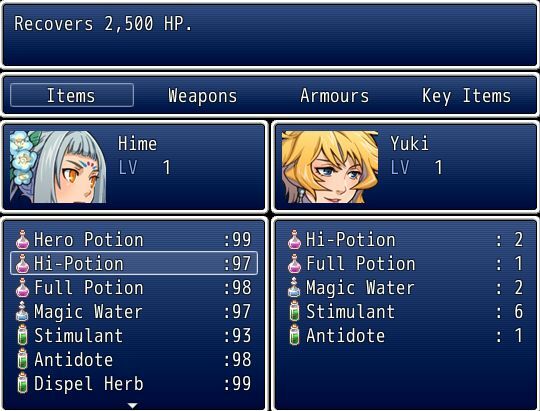 It allows provides a very simple trade scene that allows you to trade items between actors in the party as each actor now has their own inventory. This script provides the command in the party menu. When you click on the “Trade” command, it will go to the trade scene. In the trade scene, select a category, and the actor face will be selected. You can press left or right to switch between the two windows. Press page up and page down to change actors. will be traded to the other actor. When I have two actors in the team, the game is giving me the error Stak Level too Deep. Would it be possible to set it so that one of the two trade slots is unchangeable? 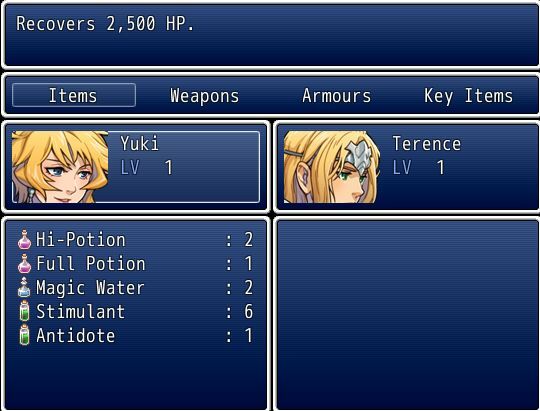 So if you want to call a specific trade between one person and the party, you could only change the actor on the left side? Also, is there a way to re-size the window so it shows the actor&apos;s full picture? I wrote the scene so that when you press page-up or page-down when the actor face is highlighted, you can scroll between party members. I haven&apos;t provided a way to lock this functionality.